The S&P 500 dipped into correction territory on Friday, down 10 percent from its record reached only back in September. The Dow Jones Industrial average was not far behind, down 8.8 percent. Which stocks do the best when the broader market is falling in a rapid correction? To find the answer, CNBC used analytics tool Kensho to find all the times when the Dow dropped more than 10 percent in a three-month span over the last three decades to determine which Dow members performed the best during those time periods. The best performers were Verizon, Travelers, Exxon Mobil, Visa and Procter & Gamble. 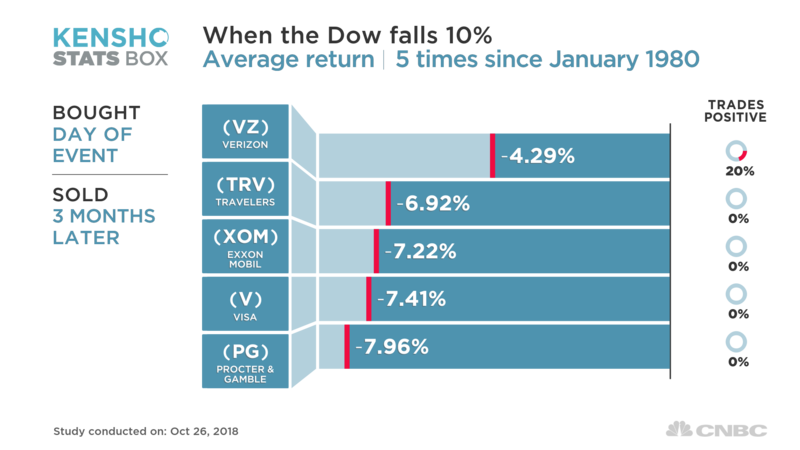 None of them averaged gains, but all outperformed significantly, with Verizon averaging a decline of less than 5 percent. Investors retained even more value when accounting for dividends. All those companies pay hefty dividends and have steady revenues, making them appealing during worrisome times. To be sure, many of these names are already outperforming the market right now so it could be a little late to ride this trend. But if there is more to go for this decline, these names could outperform, if history is any guide.